The wedding of Pien & Rene was one with many faces. We started the day at the Westerkerk; one of Amsterdam’s most beautiful churches. For the ceremony we wanted it to keep it small, romantic and light. Normally the church is filled with red chairs and a red stage, which we all took out to create that romantic feeling and to emphasize the beautiful architecture of the church with it’s big organ as a backdrop. After the ceremony all guests went on a boat for a glass of champagne and a ride to Hotel Arena. For the dinner at Hotel Arena, we wanted to create a italian square party with long tables, lights and food stands. Here we wanted a more casual feeling and therefor we chose for a mix of dishes on the tables and stands where guests could get their food as well. 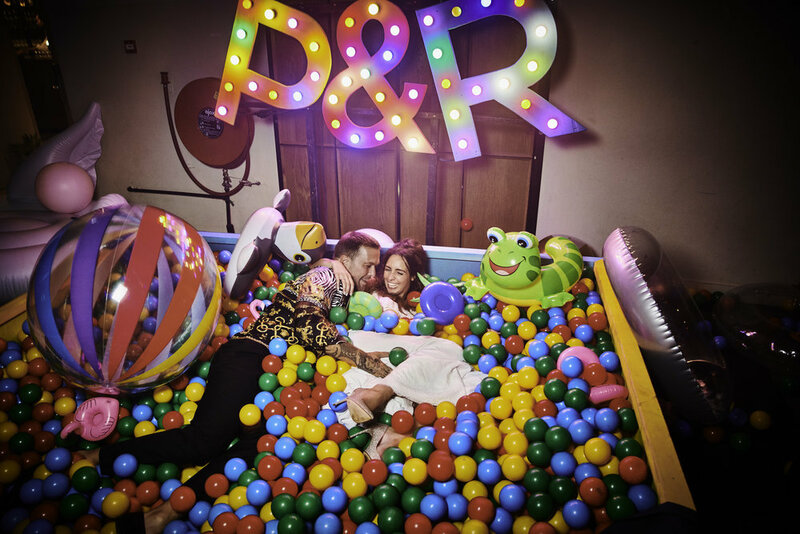 For the party we went a bit more crazy; there where inflatable animals, a ball pit, confetti and so much more. Below you can find the coverage of the day, beautifully shot by Latoya van der Meeren (analogue), Jeroen Noordij - who focussed on the styling of the venues - and RVDA.